The paintings of vagrants in the first article in this two-part series are matched by depictions of those homeless families who lived entirely on city streets. Philippe-Auguste Jeanron (1808–1877), Paris Scene (1833), oil on canvas, 97 × 130 cm, Musée de Chartres, Chartres, France. Wikimedia Commons. 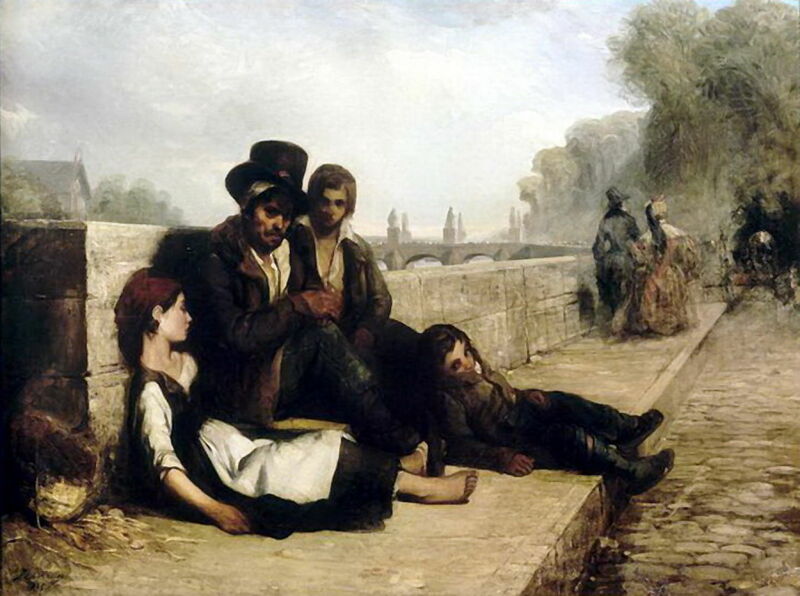 In Philippe-Auguste Jeanron’s early painting of this theme, Paris Scene from 1833, a family of four is living rough on one of the banks of the River Seine. The young woman nearest the viewer appears dressed to work in a café, with a surprisingly white apron. A more affluent couple have just walked past and are now in the distance, leaving the poor behind them. Augustus Leopold Egg’s narrative series of moralistic paintings, Past and Present (1858), traces the downfall of a once-prosperous but adulterous wife. In his third and final canvas, the woman is now living under one of the Adelphi arches beside the River Thames. She is sat among the debris, staring wide-eyed and fearful at a star in the sky, cradling a young baby to her, under her thin cloak. Behind her, on the side of the arch, are old posters, one with the word VICTIMS prominent, another advertising excursions to Paris. Gustave Doré (1832–1883), A Couple and Two Children Sleeping on a London Bridge (1871), print, 19 × 24.7 cm, Denver Art Museum, Denver, CO. Wikimedia Commons. When the great French illustrator and painter Gustave Doré visited London, he was shocked by its large population of vagrants and homeless. His print of A Couple and Two Children Sleeping on a London Bridge (1871) is one of several objective records which he made at the time. A selection were included in his illustrated book on London which was published the following year. 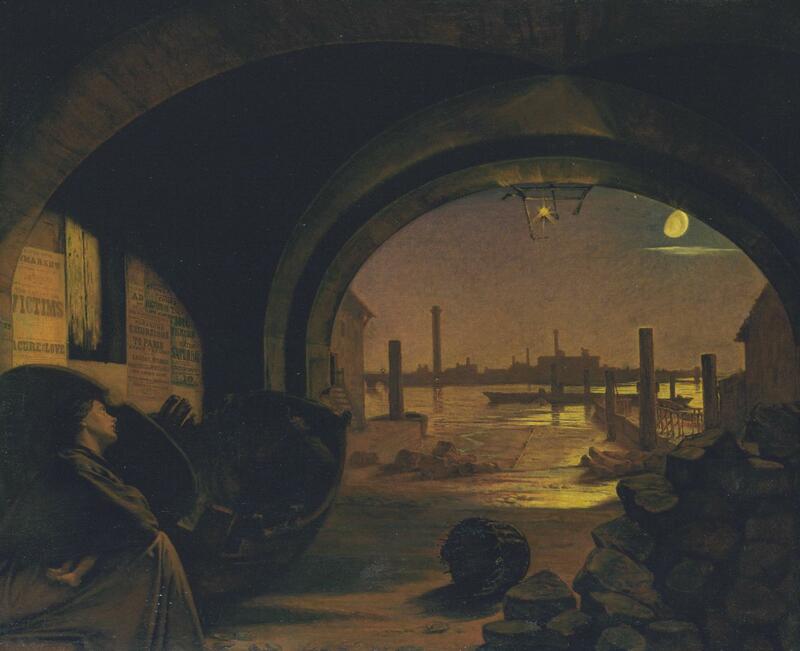 Luigi Nono (1850-1918), Abandoned (study) (1875), oil on panel, 32 x 40 cm, location not known. Wikimedia Commons. The homeless lived rough in the cities of Britain, France, Spain, Italy, and other countries in Europe. 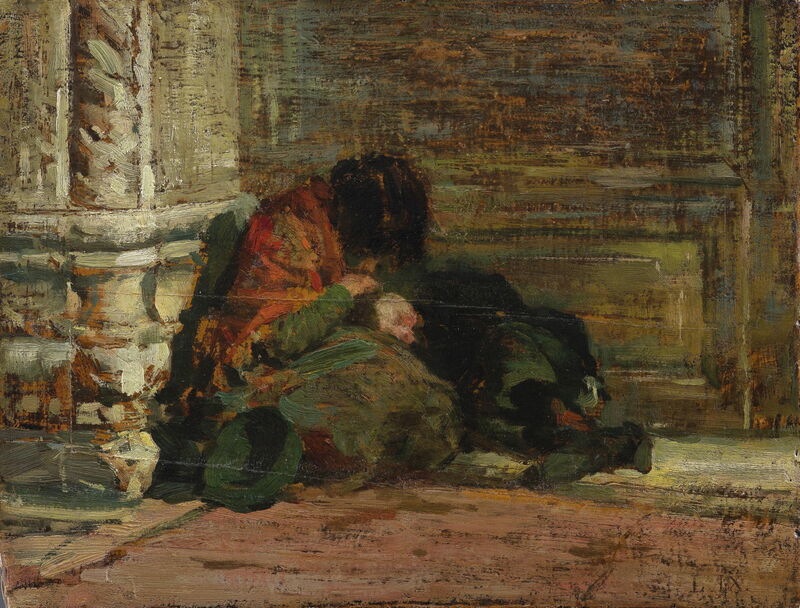 Luigi Nono’s sketchy study of April 1875 for his finished painting Abandoned shows a couple asleep in a quiet corner of Venice. 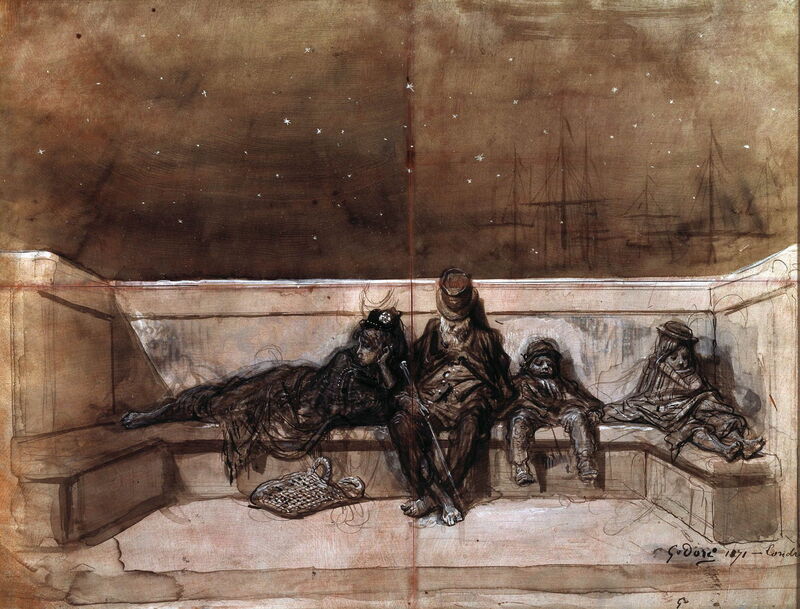 Themes of homelessness entered literature and other arts. 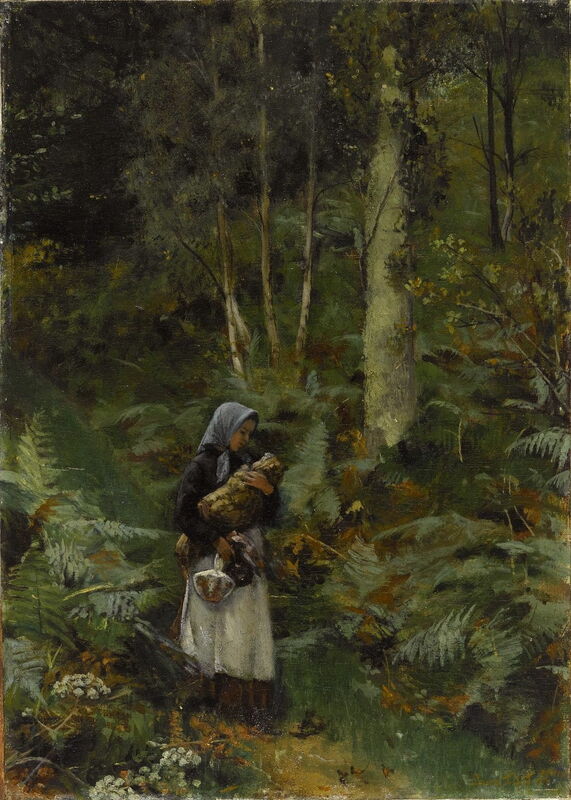 Among Laura Theresa Alma-Tadema’s generally genteel, indoor scenes is an exceptional view of the outdoors: With a Babe in the Woods (c 1879-80). This explores the popular Victorian theme of the young, homeless unmarried mother. 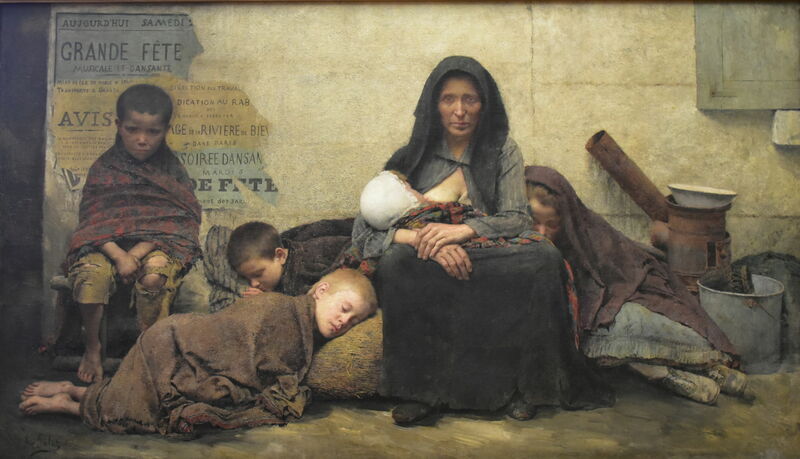 It was perhaps Fernand Pelez who shocked the public most profoundly, with his chillingly realist Homeless from 1883, showing a worn and weary mother and her five children living on the street. She stares from sunken eyes straight at the viewer, as her children huddle in filthy blankets and sacking around her. Only the mother and her oldest daughter (who is presumably already at work) wear any shoes. Homelessness continued to inspire the work of those painters with a social conscience, including Marianne Stokes. 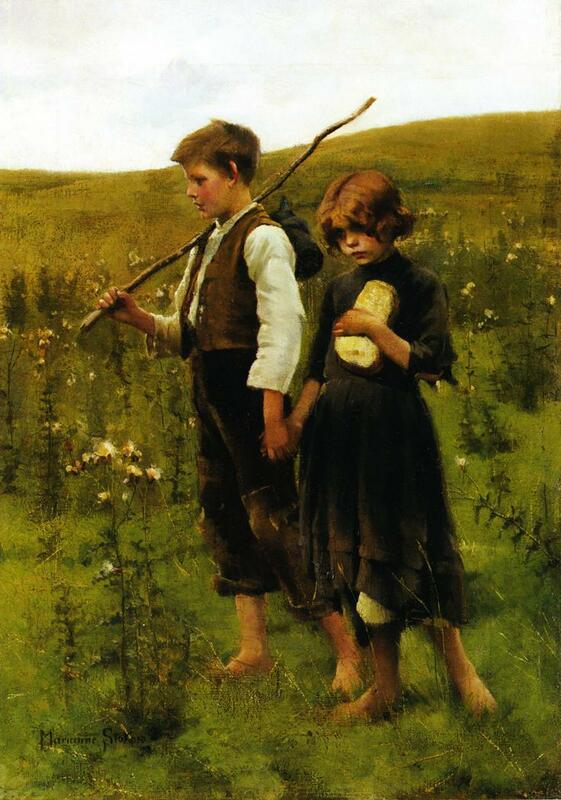 Her Homeless (On the Way to the Fields) from 1885 avoids the overt sentimentality of Mulready’s waifs, although the two children are incredibly clean and well-groomed, and their clothing appears theatrically worn and patched. Thomas Benjamin Kennington (1856–1916), Homeless (1890), oil on canvas, 166.6 × 151.7 cm, Bendigo Art Gallery, Bendigo, Australia. Wikimedia Commons. 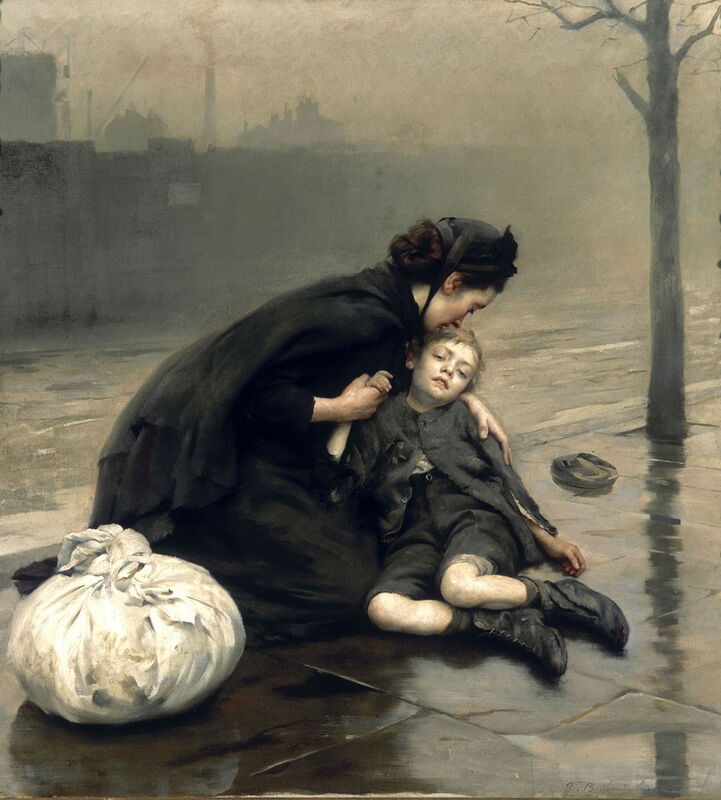 In Thomas Benjamin Kennington’s Homeless from 1890, the late Victorian period in Britain replaced sentimentality with melodrama. A young homeless and starving boy has collapsed on the pavement (sidewalk) in winter. A young woman, who had been carrying a large bundle of washing, so is presumably a servant herself, has stopped to try to revive the boy, cradling him in her arms. Social concerns became an important theme in Nordic art with the work of Christian Krohg and other Naturalists. 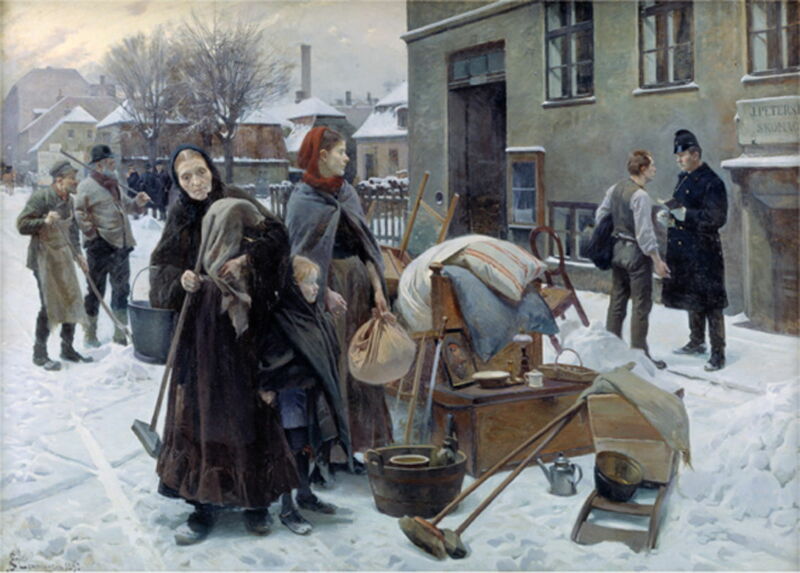 The Danish painter Erik Henningsen made a series of works examining social issues of the day, including Evicted (1892). This shows a family, complete with their meagre possessions, cast out into the snowy street of a Copenhagen winter. The father is seen distant, still arguing his case with a policeman who is standing between him and the entrance to a shoe factory. The rest of the family, three women, stand shocked by the sudden cold and their homelessness. 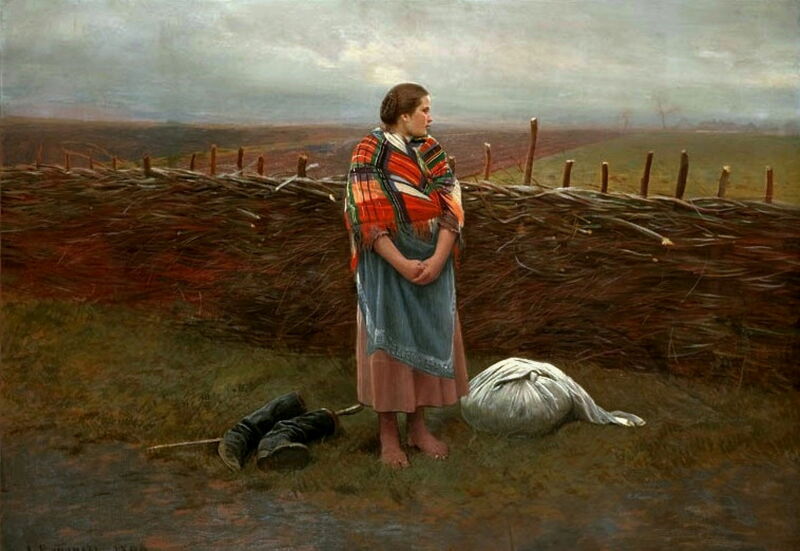 Antoni Piotrowski (1853–1924), Homeless (Country girl at the fence) (1896), oil on canvas, 110.5 × 150.5 cm, Muzeum Narodowe w Warszawie, Warsaw, Poland. Wikimedia Commons. Antoni Piotrowski’s Homeless (Country girl at the fence) (1896) shows a young pregnant Polish woman standing barefoot by the side of a country road. Her few possessions are laid out around her: a pair of worn boots, a bundle of clothes, and a stick. My final painting in this selection is by the Norwegian artist Aksel Waldemar Johannessen, who painted many works showing areas of social concern. 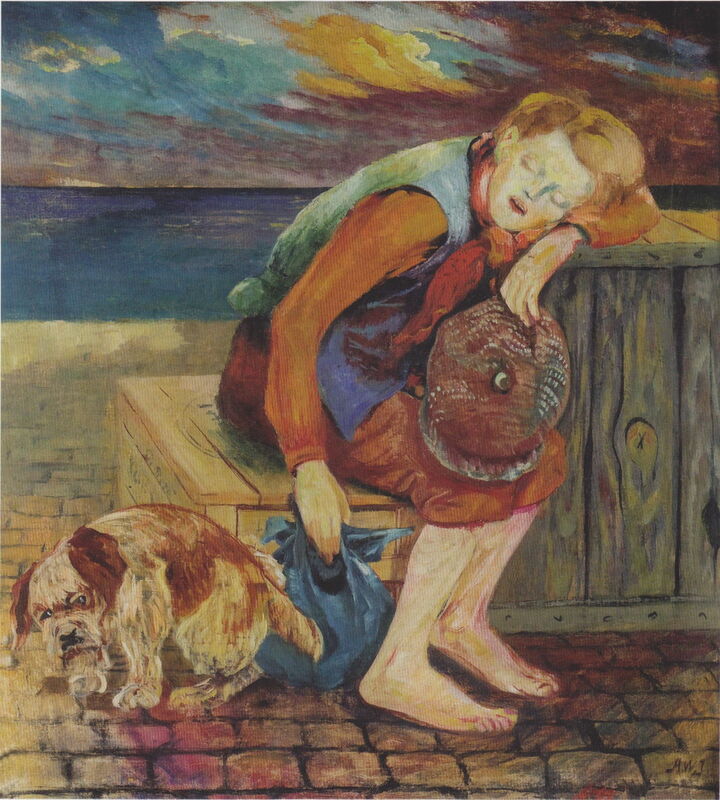 His Streetboy from 1918-22 shows a homeless boy asleep on some packing cases in the docks, his small dog looking equally hard done by, beside him. From its humble origins in the paintings of Murillo, during the latter half of the nineteenth century, artists increasingly raised awareness of the growing problem of homelessness and vagrancy among the poorest of the poor. Although many paintings lacked authenticity and reeked of sentiment, the romantic, or melodrama, an objective social realism, ‘Naturalism’ if you like, developed in the 1880s, which increased the impact of these works. The paintings of Mulready and other sentimentalists helped transform the image of the poor from being idle good-for-nothings who only merited a little small change, to cute unfortunates worthy of more organised charity, but did nothing to challenge the society which created them. It was the raw and objective images of the Naturalists which brought some of the affluent to examine the causes of social inequality, and what should be done to change society. At last, artists were engaging with the major social issues of the day, and taking a role in the changes which were to occur in the twentieth century. Posted in General, Life, Painting and tagged Alma-Tadema, Doré, Egg, Henningsen, Jeanron, Johannessen, Kennington, naturalism, Nono, painting, Pelez, Piotrowski, realism, Stokes. Bookmark the permalink. Last Week on My Mac: Is the macOS command line doomed?